As we place the final batch of canning on our pantry shelves, I have to admit that my heart is full of pride over what is before me. Row after row of colorful jars sits filled with this seasons bounty of organic heirloom produce. Onions, garlic, and herbs hang from rafters, and numerous buckets and crocks are bubbling away, fermenting happily. As I take a moment to absorb the work that has gone into building this pantry, thoughts wander to my Granny Lee who would have appreciated this. She lived in an era where producing your food was ordinary. Rather than seeing her family go hungry she built a garden and raised chickens. This garden kept her family and neighbors well fed. Nearly seventy years later, we are doing the same thing. There is a growing movement of people concerned about food security, revitalizing the old ways. They are taking matters into their own hands just like my Gran did. It’s hard work. It’s a massive lifestyle change. If you are one of these people, then I hope you take the time to admire and reflect on your achievements. Not only are you making a healthy, sustainable choice for yourself, but you’re also the “thin edge of the wedge” of a positive social movement. If you are ststarting out with growing and preserving your food, I am excited for you. There is so much information and support available online these days. Take it day by day, and you will reach your goals quickly. You might want to begin with making jams and jellies and pickles which are easier and can be done without any major specialty equipment. Here are some of the things that we like to grow, grouped by how we have preserved or stored them for the winter. We have linked to some of the recipes as well. There is plenty of other food in the pantry, but this is a list of what we have produced using our homegrown ingredients. Picking is really easy and if you are new to canning its the best place to start. When making a variety of products at the same time, I make a big batch of my multi purpose brine and season the jars individually. Jams and jellies can be made with a water bath canner. They are very simple to make. 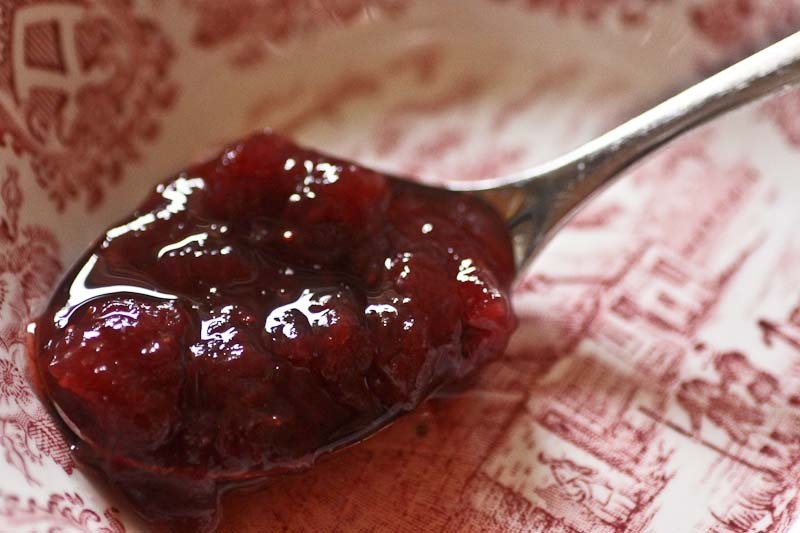 We have an intro to making gourmet jams and jellies that you might enjoy reading. 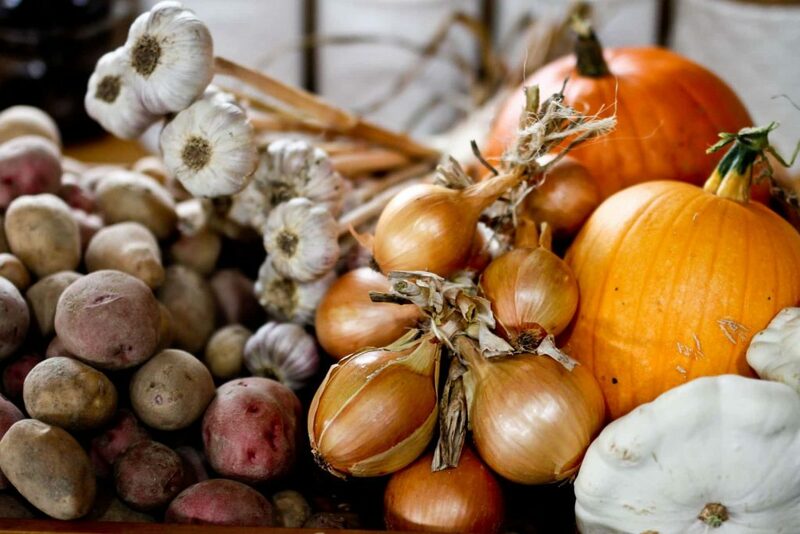 It takes a lot of vegetables to fill a pantry for winter. We had over 200LB of tomatoes for canning and that was about half of what we really needed to feed two people. 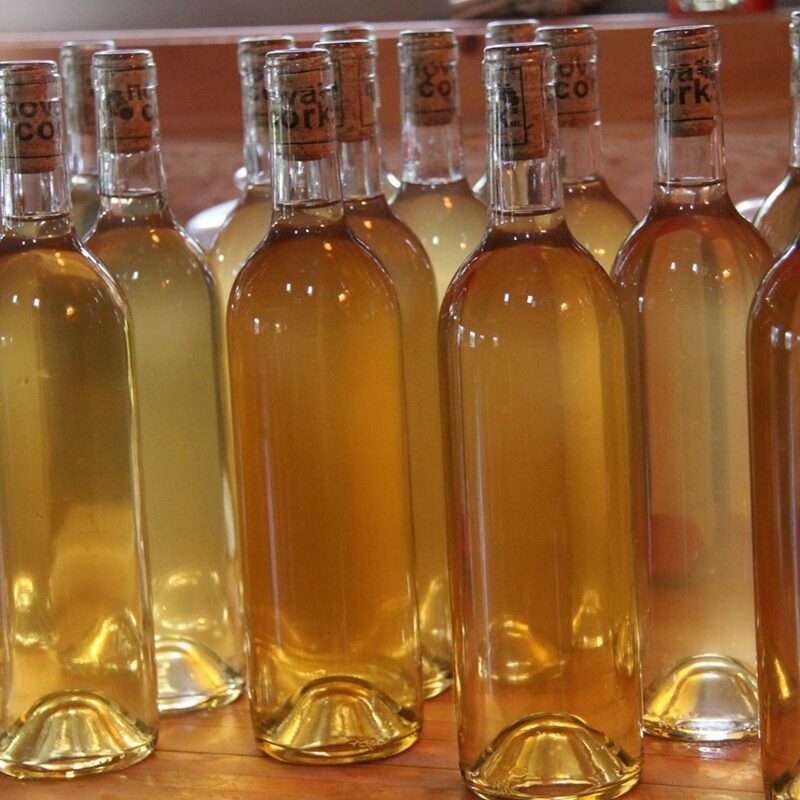 Wild crafted wines are quite fun to make, although they do take patience. Most recipes improve with age and as such you’ve got to wait 6 months to a year after bottling them to truly enjoy your work. It’s worth the wait! One of the most helpful books I’ve read on the subject is The Wildcrafted Brewer and the River Cottage Handbook: booze is quite a marvelous volume if you can get your hands on one. You don’t need a lot of supplies to get going and it really isn’t complicated. Once you’ve worked your way through a recipes you’ll see how easy it really is to make a nice wine from items you grow in the garden. This year we focused on apples, there are a number of wild apple trees in the woods that surround our property and we managed to bring home many bushels but we’ve got all kinds of wine on the wine rack and each one is enjoyable in its one way. 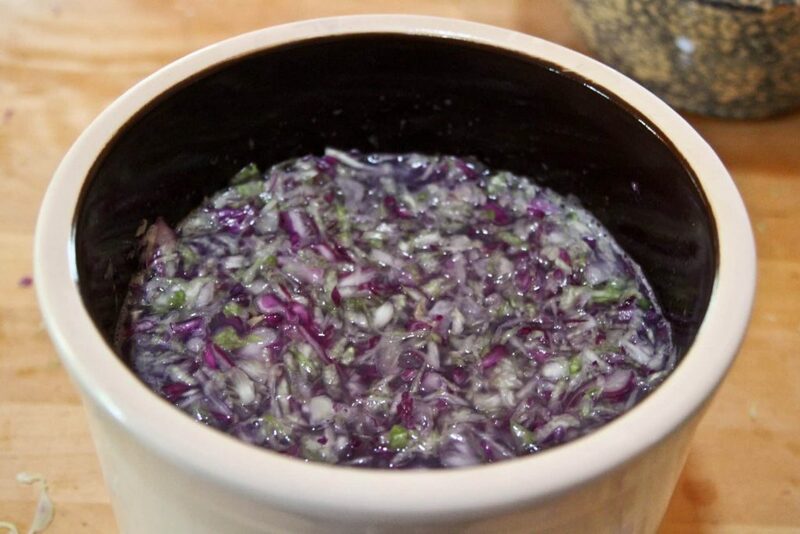 Fermented foods are filled with probiotics and enzymes for gut health. 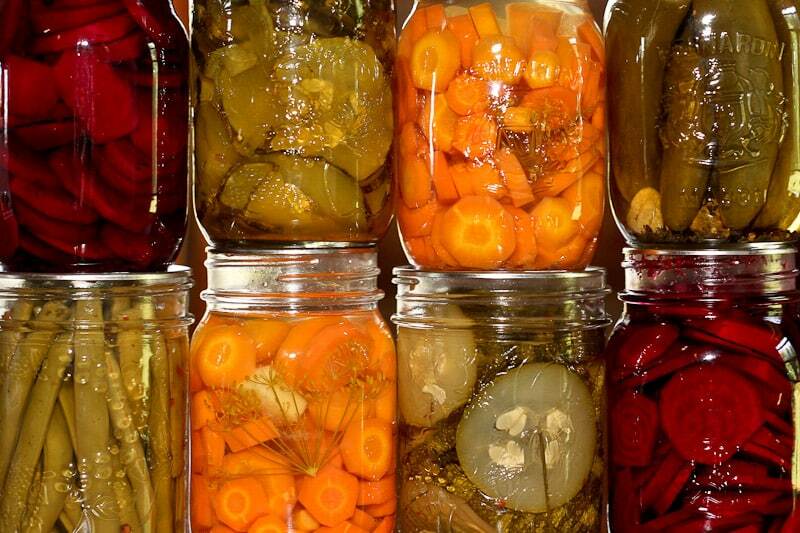 Fermentation is our favourite way to preserve food! Dried goods are stored in air tight glass jars to preserve their freshness. It’s important to make sure your dry goods are completely dried before storing them. We have a variety of vegetables stored for the winter. We keep them in a cool dark location. The carrots, beets, and turnips will stay in the garden until just before the ground freezes. We’ll then dig them up and pack them into the cold room for winter storage. 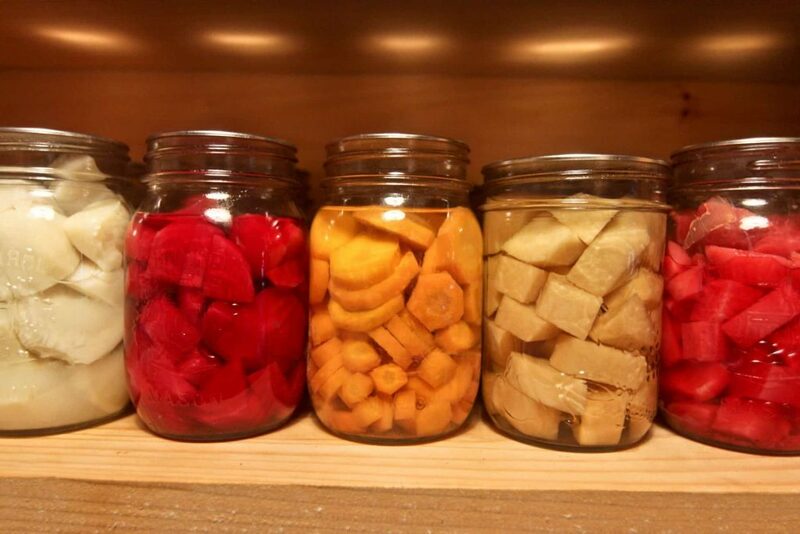 This article covers some ideas on methods for cold storing root vegetables. Growing your own herbs and medicinal flowers can save you a lot of money and empower you with healthy healing alternatives. It is quite easy to dry herbs especially if you live in a dry climate. Humidity is the biggest challenge you’ll face when drying them. You can use a low setting on a food dehydrator or you can hang them in bundles in a cool/dark location. If you live somewhere that there is a lot of humidity air drying can be a challenge and in that situation, I suggest a food dehydrator, this can be especially useful with wetter herbs like basil that can go moldy before they have properly dried. Once the herbs are dry place them in air tight jars to prevent them from absorbing any new moisture. I like to open the jars for a minute every day and close them again for one week to make sure that all moisture has indeed been removed from the plant material. For next year we plan on growing fewer varieties, more volume and will be more particular about the varieties we select. We want heavy producers. This year we had nine types of tomatoes and four of them were cherry types. It was a real pain (although delicious) to process those. I also grew frivolous things like peanuts and gourds that took up valuable space in the garden. We ended up with a mere SIX peanuts out of that arrangement (lol). 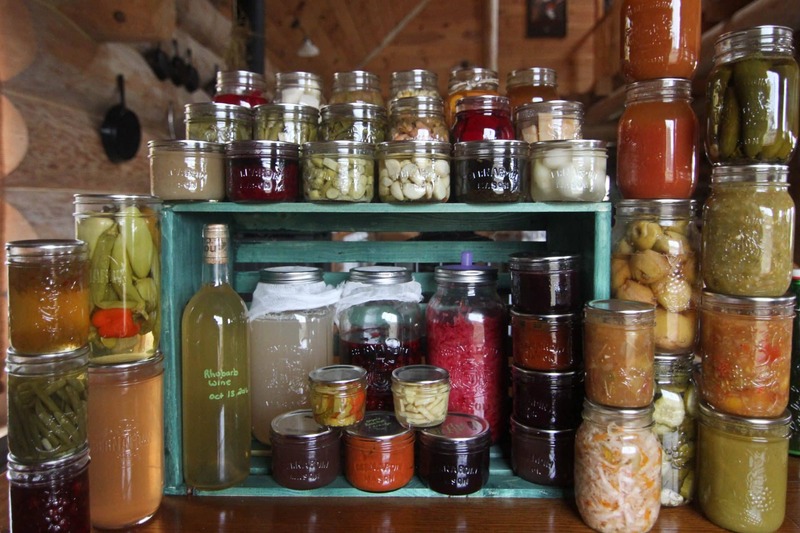 The mad season of preserving and storing food for the winter has wrapped up and just in time. The wood stove has slowly started its winter duties and it’s cold enough for flannel and toques. The root veggies are still in the ground for a few more weeks but otherwise, the growing season has come to an end. The stocked pantry is comforting with the onset of what is expected to be a particularly harsh winter. 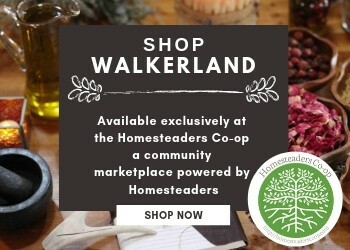 If you found this interesting you might also enjoy reading: How to Stock a Pantry like a Pro with practical tips on saving money while stocking up and A Homesteader Well-Stocked Pantry with even more practical tips and details on how we keep a well-stocked pantry. 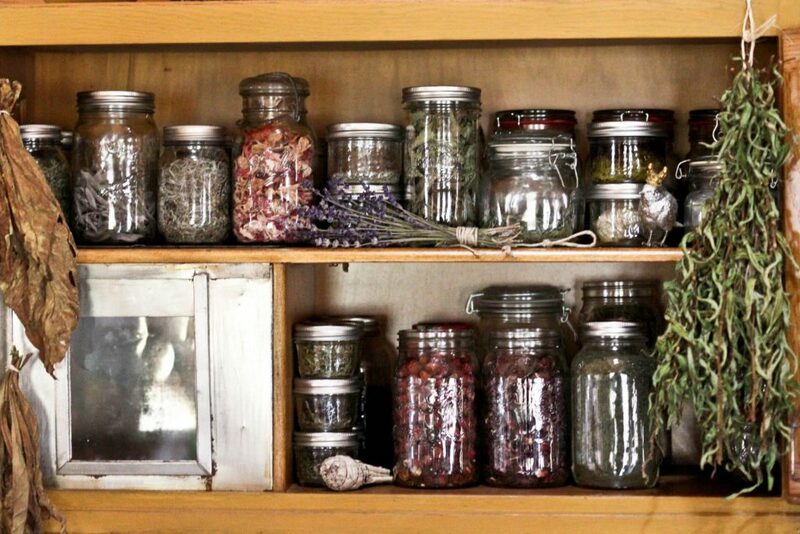 Your pantry is absolutely beautiful and inspiring. Hope you both are doing well. Your blog is going to be invaluable in helping us transition to a more self sufficient lifestyle. Thank you for taking the time to share your knowledge. Thanks so much for the thoughtful feedback, we really appreciate it. I’m betting, your pantry is the envy of everyone who sees it. I know I would love to have it in my home. Congratulations to a job well done. Thank you so much for the kind feedback. The pantry is something we are quite proud of. It is a bit daunting at times, being responsible for the food your family eats but over time we are becoming more confident in our skills. It can seem like a lot of food at first glance but it does have to last us many months. I will share an update on what it looks like by spring. Only a year late to the party, but: this is the single most inspirational blog entry I’ve ever seen. I love how it makes me feel like I’m in the pantry, browsing the shelves! You’re my hero! I would love to see your work! I love peeking into other canners pantries. It’s such a neat experience. Thank you for sharing all your wisdom! You guys are so inspiring! We’re planning to move from our little homestead where we are now to a bit bigger piece of land this year and build a tiny house instead of working for other people to make money to pay the bank to live in a house that is way bigger than we need. Our goal is to grow/raise 95% of our food. 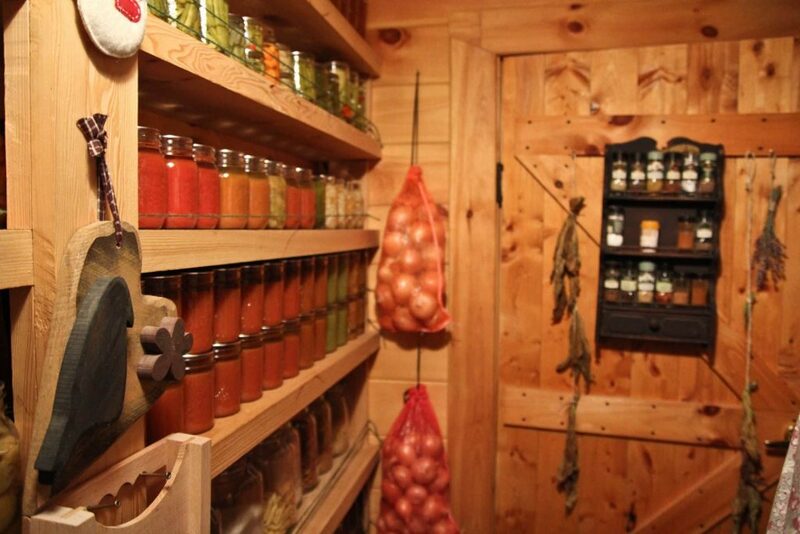 We’ve been raising all our own meat for 2 years now and a lot of produce, but I aspire to have a pantry like yours. I hope you didn’t throw out the dandelion wine gone wrong. Thank you so much for sharing your story. 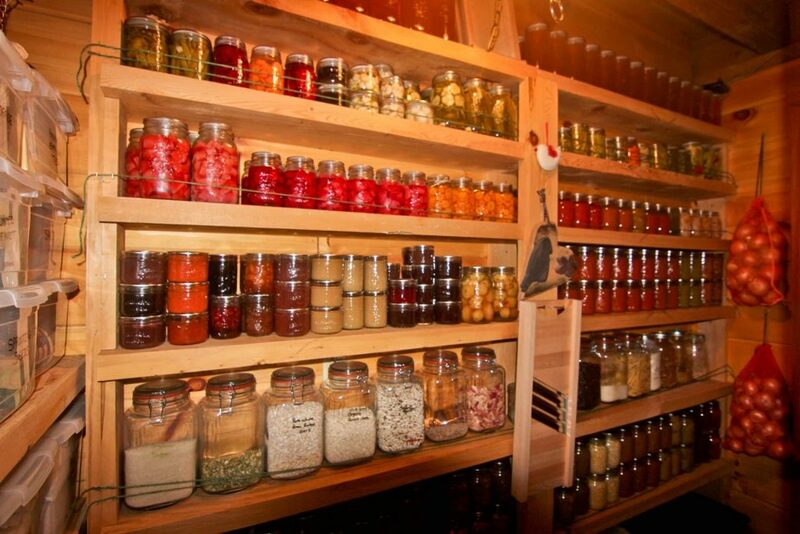 I always wanted to stock my shelves with home grown food for the winter. I will continue to accomplish this. You are an inspiration. 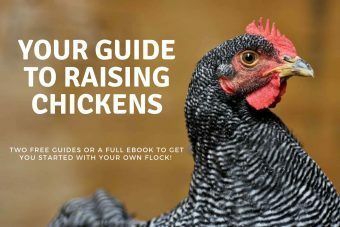 I do not have any animals on my homestead. 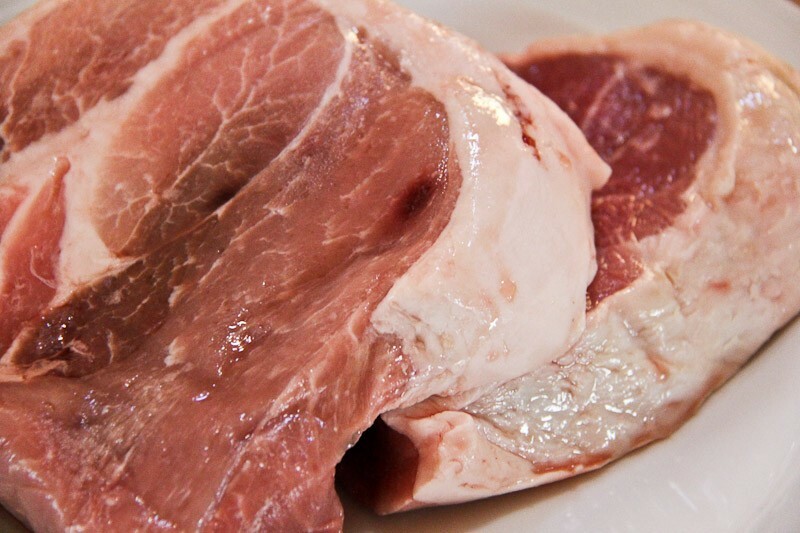 Do you can meat? I have seen some recipes for it. I know canning what you have is a lot. Also, I have taken my overabundance of garlic and onions. Dehydrated them and made powder for my seasoning group. It helps to preserve them. You might like to try it. Also have you canned water or milk. I have learned to make evaporated milk with powdered milk. Also you may want to add canned Sweeted condessed milk to you pantry. I also make my own vanilla and it is great. I work at making my own butter, seasonings like Taco seasoning, Poultry seasoning, etc.. Try canning some mushrooms or make your own cream of mushroom soup and can that for sauces over a roast. or to make beef stroganofe. Oh I also dehydrate celery and make a celery powder. Love reading your post.